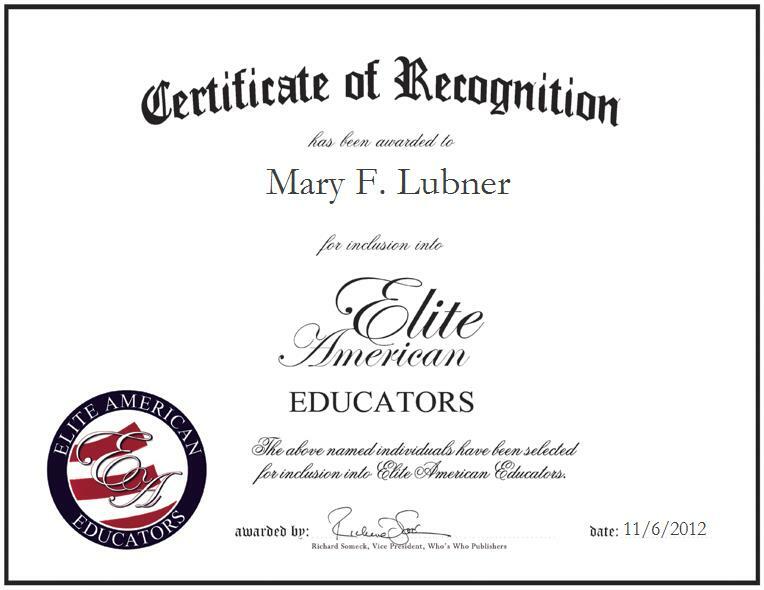 CEDARBURG, WI, November 6, 2012, Mary F. Lubner has been recognized by Elite American Educators for dedication, achievements, and leadership in physical education. Ms. Lubner is retired after a long and successful career as an elementary school physical education teacher. Involved with 4-H since her youth, Ms. Lubner remains active in 4-H as a leader and ambassador with the organization. She has hosted chaperones from similar organizations from overseas, and has chaperoned 4-H groups to areas such as South Korea. She has studied Taekwondo for over 25 years and is a 5th degree black belt. Prior to her retirement from her former post as an educator, Ms. Lubner was responsible for teaching between eight and 10 classes on a daily basis. She also supervised the playground, served as a union representative, graded papers, and prepared lesson plans. Ms. Lubner pinpoints the most gratifying aspect of her teaching career as being able to touch the lives of so many youths and helping them to become adults. For nearly four decades, Ms. Lubner has built on an ever-emergent skill set, which currently enables her to spread her wealth of knowledge and experience throughout an array of professional arenas, thereby lending her talents to worthy causes. She is on the County Board of the 4-H Leaders’ Association, and a member of the Wisconsin Retired Educators’ Association. She is also a member of the Wisconsin Association for Health, Physical Education, Recreation and Dance, the Wisconsin Education Association Council, the Northshore Education Association, the National Education Association, the United States Taekwondo Association, and the American Alliance for Health, Physical Education, Recreation and Dance. In her spare time, Ms. Lubner enjoys traveling and taking in the niceties of nature.